Welcome. Myrons Mopeds Tire Department is unique in that it covers the overlap region between bicycle tires and motorcycle tires. The widest bicycle tires can fit some motorcycles, and the thinnest motorcycle tires can fit some bicycles. But the meaning of “size” is not the same. 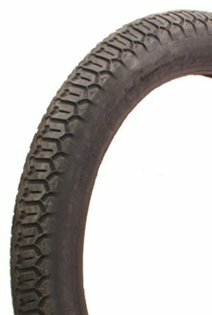 Bicycle tires use the outer tire diameter to mean the size, while motorcycle tires use the inner tire diameter to mean the size. So a 16″ bicycle tire fits completely inside a 16″ motorcycle tire. See below. To clear up the confusion of multiple meanings of “tire size”, this Tire Department groups the tires by rim size. Fourteen inch rims are pretty much only on mopeds and kid’s off road bikes. Bicycles have rims 12 (16 tire), 16 (20 tire), 18 (22 tire), 20 (24 tire), 22 (26 tire), 24 (28 tire) inch, and many others, but not 14. 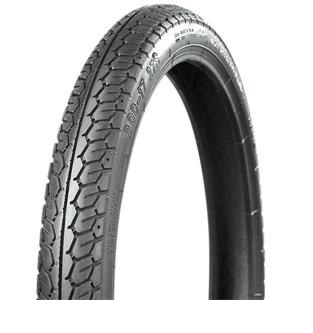 Instead the 18″ bicycle tire fits a 13.2 inch rim, not 14.0. 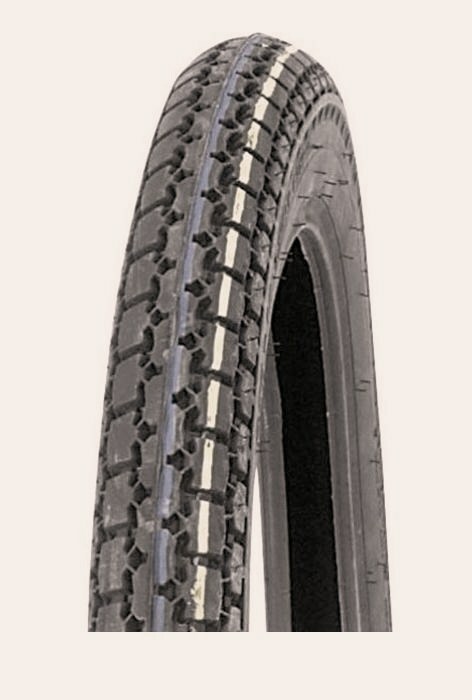 “2.50 – 15” trail tires. 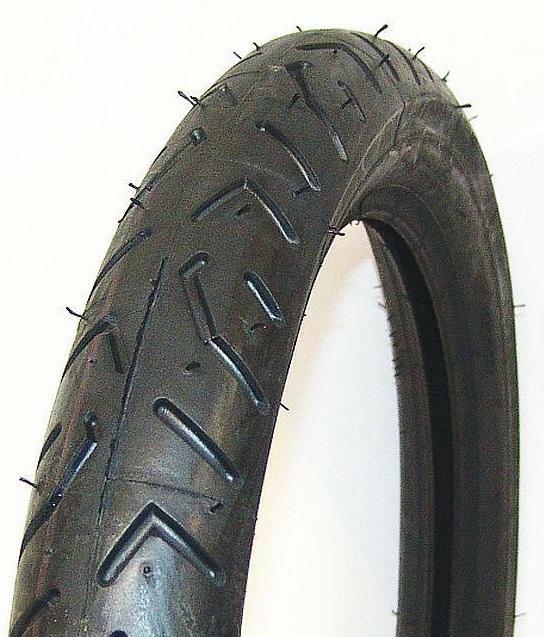 Wide tires for 15 inch rims are common on modern street motorcycles, like “130/90 -15” (5 inch wide) to “170/80 – 15” (6 1/2 inch wide), but thin 15’s are uncommon. 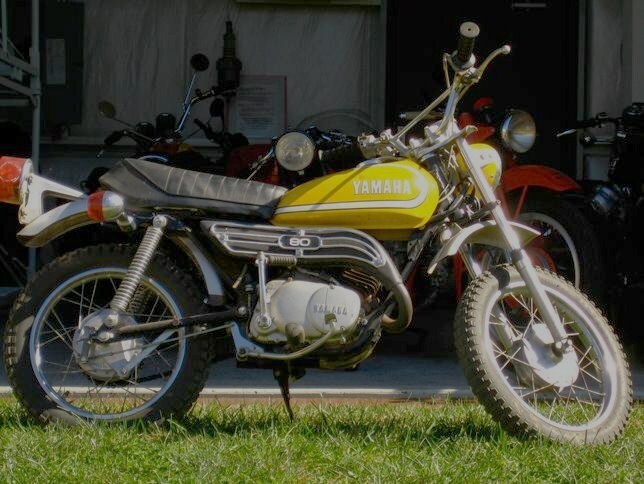 Size “2.50 – 15” (2 1/2 inch wide) is pretty much only found on 1970’s small trail bikes by Yamaha, Kawasaki, and others. No bicycles have that 381mm rim size. So there’s only this one choice. 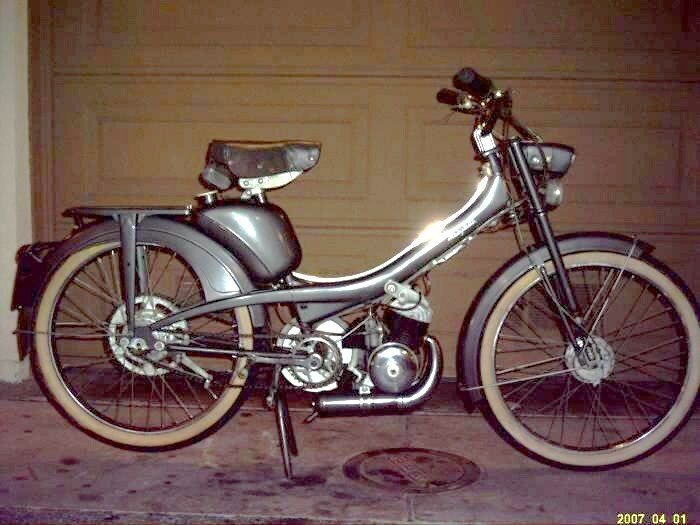 Tires for sixteen inch rims are on about 1/3 of all USA mopeds, while 17″ is the other 2/3. 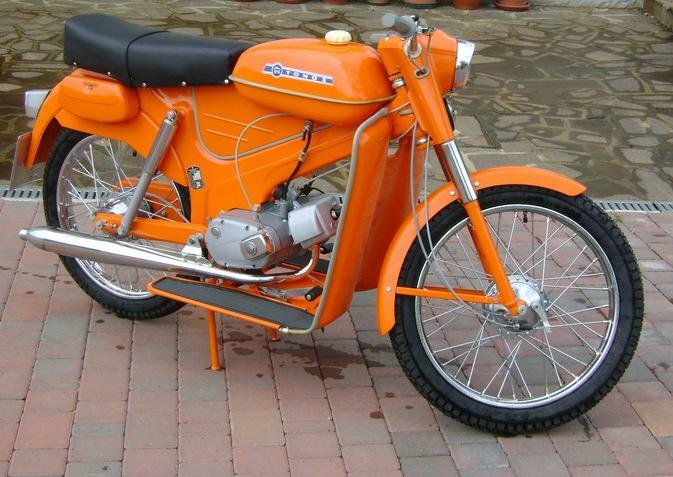 Almost all Italian mopeds use 16″ rims, with mostly 2.25 – 16 (20.5″ OD) tires. Juvenile and BMX bicycles all use 16 inch rims, but they are called 20″ in the bicycle industry. 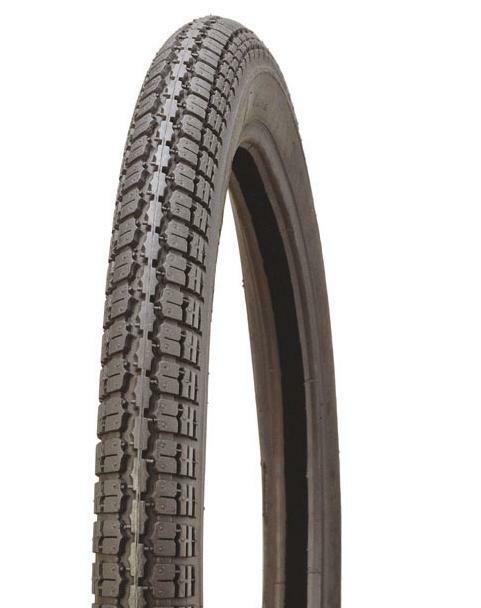 Yes, 20 x 2.125 bicycle tires interchange with 2.25 – 16 motorcycle tires, because they both use 406mm rims. Motorcycle tires for on-road use have to meet US DOT standards, and have many things labeled on the tire. 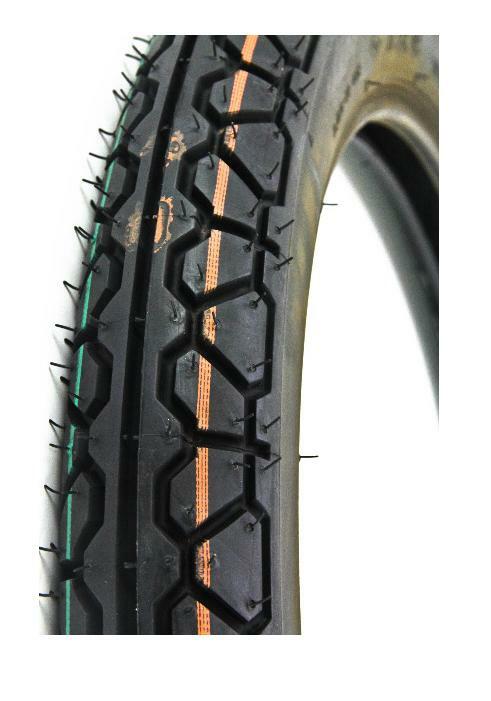 Bicycle tires have different safety standards, and are not legal and not safe to use on on-road motorcycles. The Mitas 3.25-16 is 3.6″ total width. 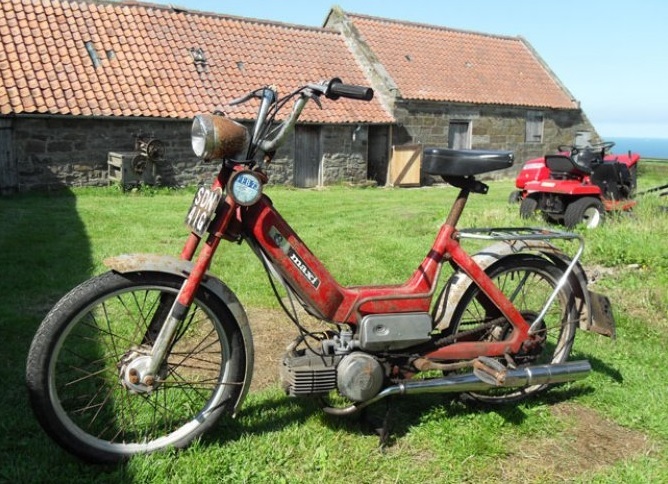 It is the back tire on Tomos Streetmate and Revival mopeds. The Shinko 90/80-16 replaces it, but has a lower profile, which lowers the back of the bike a little, and lowers the gearing slightly. The Sava 2.50-17 is 2.7″ total width. So some tires are wider than the size says, because there is a shoulder where the tread goes wider than the sidewall. Some 1960’s tires were labeled narrower than modern tires. The Harley Davidson M65 original tires said 22 x 1 3/4 (1.75 – 18), but they were actually 2.00 or 2.25 in width. You can see the restored M65 rear tire is thinner than the rim. Yet in old photos the tires are wider than the rims. 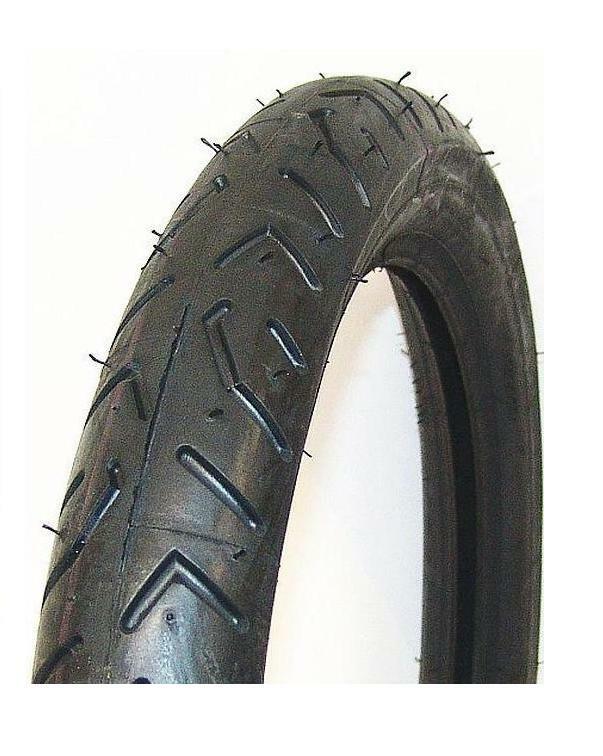 A 2.25-18 motorcycle tire is a better choice than a 22 x 1.75 bicycle tire. 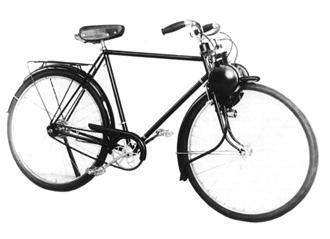 Many vintage motorized bicycles had 19 inch rims, with (now obsolete) bicycle tires size 23 x 2.0 (equal to 2.0 – 19 or French 550 x 50B). 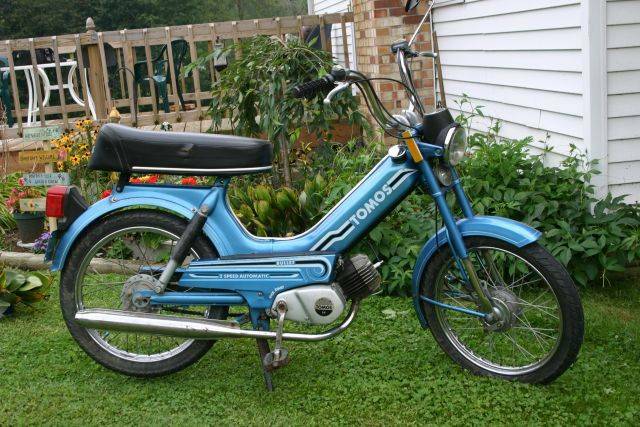 By the 1970’s, tires were smaller and wider, 16 and 17 inch. 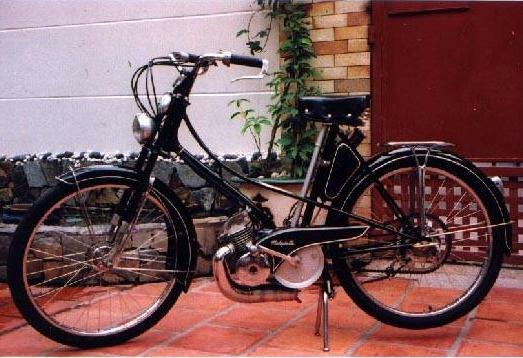 Of the US model mopeds, only the Solex had 19″ rims. 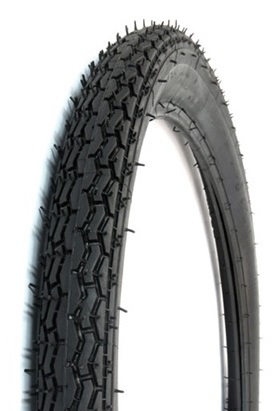 19 inch tires thinner than 2.75 are not sold by normal USA motorcycle or bicycle tire suppliers. 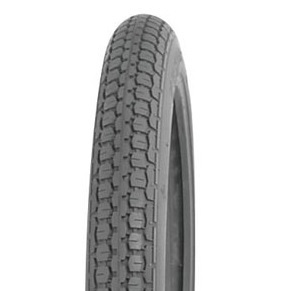 The thinnest “metric street” tire available is 80/90 – 19, which is about 2.75 – 19. 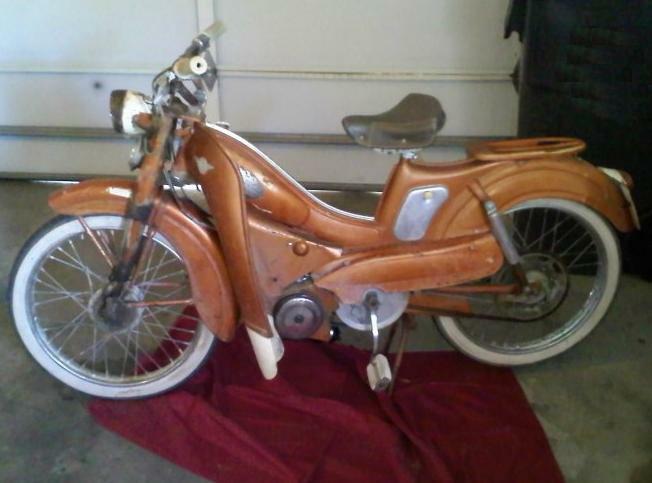 This ’59 Wards Riverside (MB AV88) has 19″ rims. with “23 x 2.25” tires. 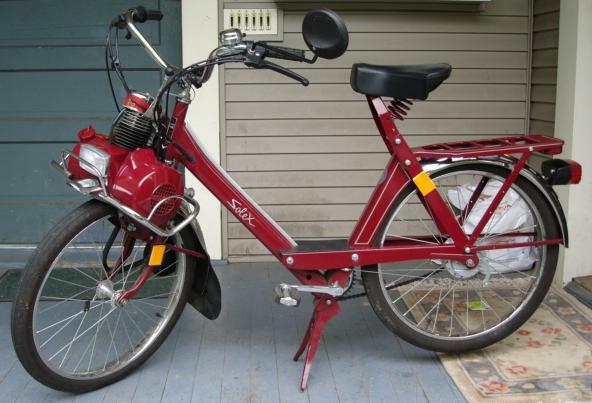 This 2000 Solex 3800, an Impex remake, has 19″ rims with 1.75-19 tires. 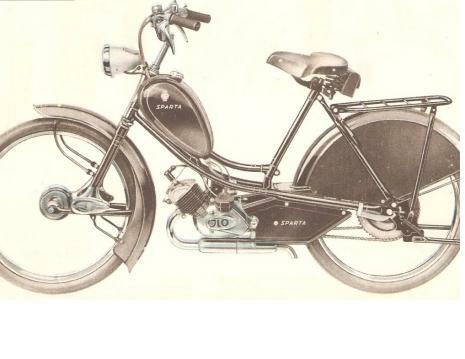 Some vintage motorized bicycles had 20 inch rims, that accept bicycle size 24 x 2.125 “balloon” tires. For them, fat bicycle tires, for a mini beach cruiser, are an affordable option. Street classic tread all black is shown, but other choices exist. Whitewall 24 x 2.125 available also. 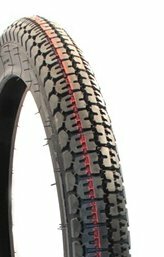 Most bicycle shops carry 24×2.125 tires also. The ISO number on every bicycle tire is what tells the rim size. 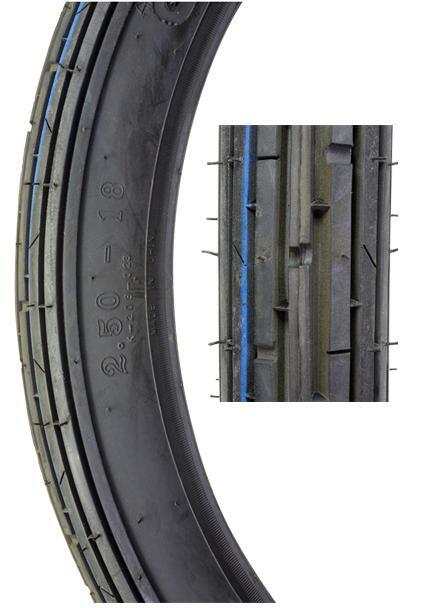 This tire says 57-507, which means 57mm wide (2.24″) and 507mm (20.0″) inner diameter. 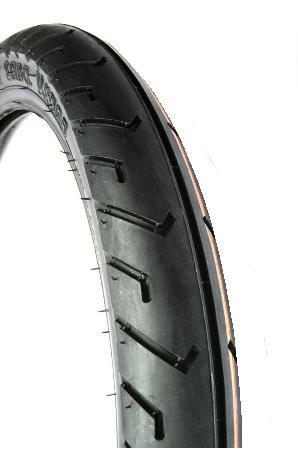 Twenty one is a common front rim size on off road and street cruiser motorcycles. 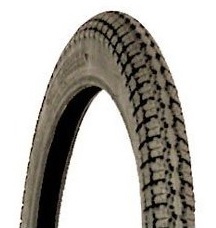 The thinnest street tire is 80/90-21, which equals 2.75-21. The thinnest off road commonly available is also 2.75 – 21. 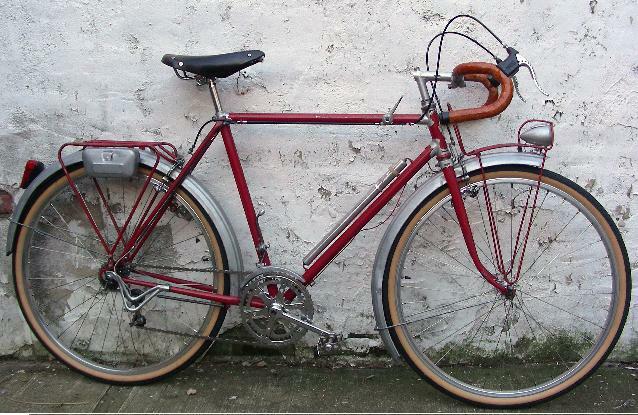 Vintage French bicycles had 21″ rims with “600B” or “24 x 1-1/2” tires, but not modern bicycles. Any rim can be measured to determine the bead diameter, where the tire sits. One way is to wrap a cloth measuring tape around the tire-less rim to measure the circumference, then divide by 3.14. See Sheldon Brown Rim Measuring for more details. 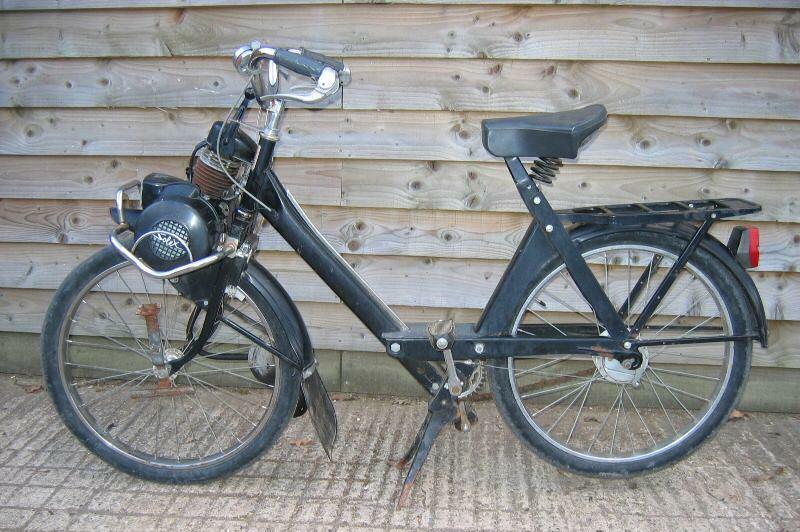 Some vintage motorized bicycles had 22 inch rims, that accept bicycle size 26 x 2.125 “balloon” tires. 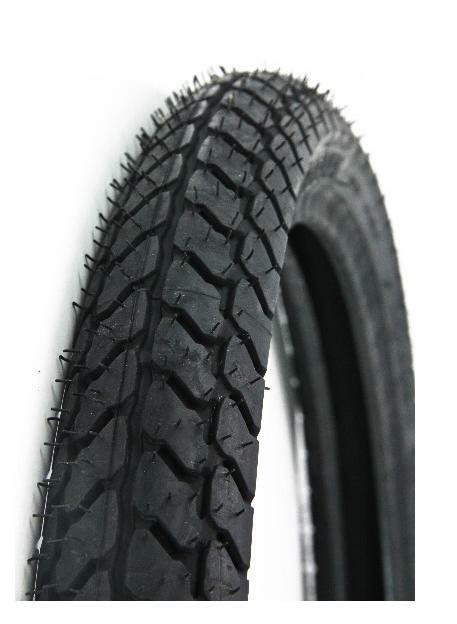 For them, wide bicycle tires, for a beach cruiser or mountain bike, are an affordable option. Street classic tread all black is shown, but other choices exist. Whitewall 26 x 2.125 available also. 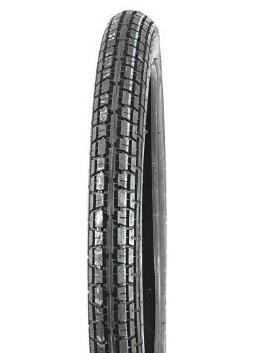 Most bicycle shops carry 26×2.125 tires also. The ISO number on every bicycle tire is what tells the rim size. 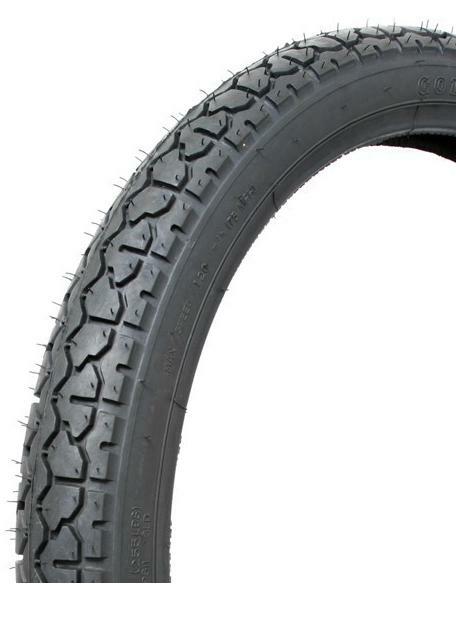 This tire says 57-559, which means 57mm wide (2.24″) and 559mm (22.0″) inner diameter. For more about tire sizes see Sheldon Brown Tyre Sizing. Bicycle tires are intended for low speed and low weight. They have no motor vehicle safety endorsements, like “street-legal” or “DOT” tires do. They are listed here to show what all the choices are. But they are not recomended for use on motor vehicles. 23″ rims with 650B tires. 650 is the outer diameter. B is the width, 33mm. or “26 x 1-1/2” tires. Twenty three inch rims are on antique motorcycles, and on some off road front, and also some on road front customs for novelty. Modern downhill mountain bike racers use 23 inch rims, called “27.5 x 2.0”. 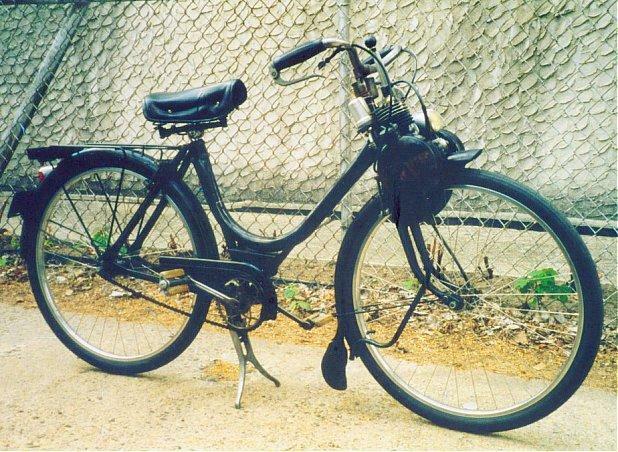 1950’s French bicycles use 23″ rims, called “650B” or “26 x 1-1/2”. Some modern commuter bikes also use 650B tires (584mm rim), in-between a mountain bike 26″ (559mm) and road bike 700C (622mm). 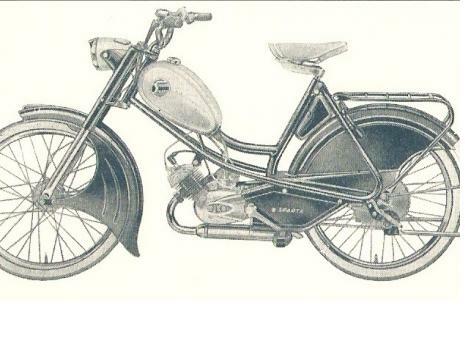 Antique motorcycles from the 1910’s, 20’s, 30’s use the bicycle system, where the tire size means the outer diameter. So, at least some 28 x 2.5 tires correspond to 2.50 – 23, but maybe not all. A 28 x 2.5 or 28 x 3.0 antique replica tire costs around $200 and up from Coker Tire. Measure the rim diameter precisely to determine the rim size, on any vintage, antique, or unknown motorcycle. A 23-inch-rim tire costs ten times as much as a 22-inch-rim tire! For some reason, there are no bicycles or motorcycles, except for some antique ones possibly, with 24″ rims. 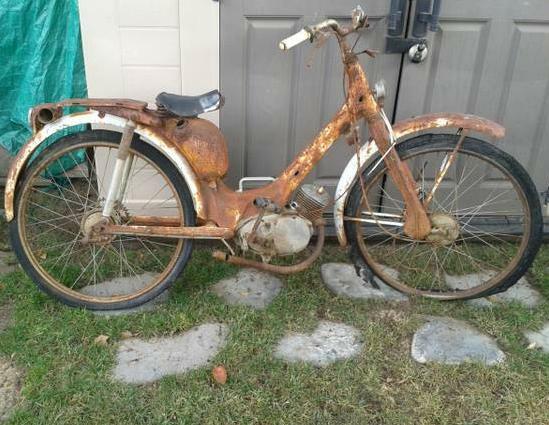 If there were any antique motorcycles with “28 x 2.0” or “29 x 2.5″ tires, they likely had 24” rims. 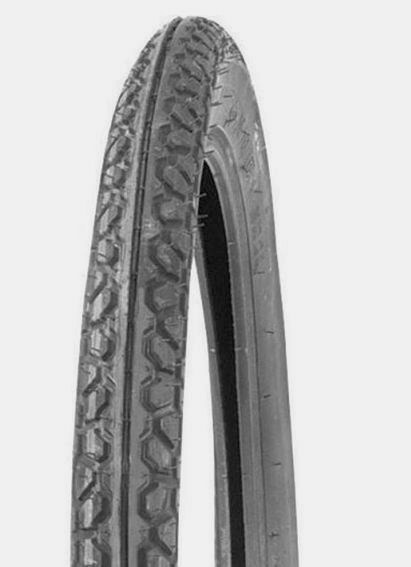 Most early motorcycle tires were “28 x 2.5″, assumed to be a 23” rim, or “28 x 3.0″, assumed to be a 22” rim. or “28 x 1-1/2” tires. Twenty five inch rims are not on any motorcycle. They are on older traditional bicycles, still common “work horse” bicycles in Europe and Asia, today. In less developed places in the world, the 28 x 1-1/2 tires, rod brake (not cables), always black, classics out number all other vehicles. 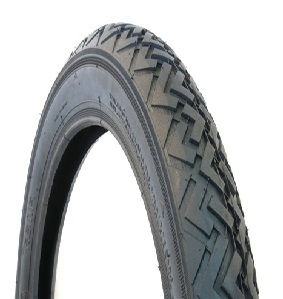 The “700B” French size tire had a height of 32 or 33mm, to make an outer diameter of 700mm. As you go back in time, tires were bigger and thinner, just like with automobiles. A bicycle 16″ tire fits inside a motorcycle 16″ tire. The “size” of the tire has a different meaning for bicycles, than for motorcycles and cars. For bicycles, the tire size means the outer diameter of the tire. 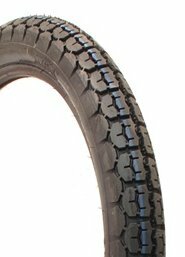 For motorcycles and cars, the tire size means rim size, which is the inner diameter of the tire. So a 20 x 2.125 bicycle tire fits a 16″ moped rim. 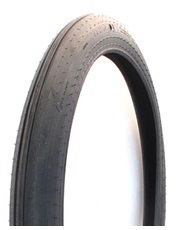 Conversely, a 2.25 – 16 moped tire fits a 20″ bicycle rim. 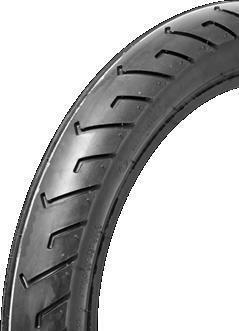 Vintage motorcycle tires: After about 1969, motorcycle tires no longer used the bicycle system. 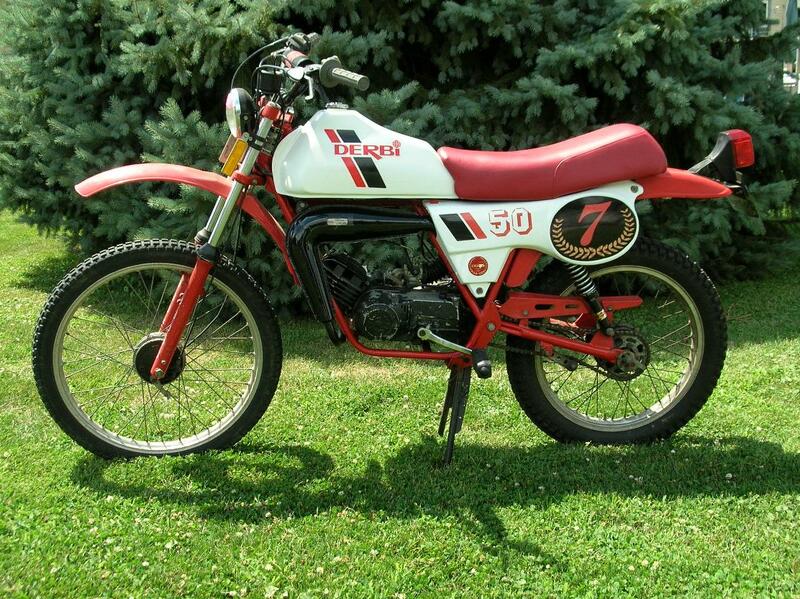 From then on, “22 x 2.0” meant bicycle 18 inch rim, and “2.0 – 18” meant motorcycle 18 inch rim. Bicycles were given the even numbered rim sizes 16, 20, 22 while motorcycles were given the odd numbered rim sizes 17, 19, 21, 23, pretty much. 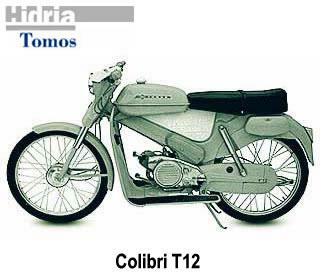 Bicycles were given the “outer times width” syntax “22 x 2.0”, while motorcycles given the “width dash rim” syntax “2.0 – 18”. The “x” and the “-” are not interchangeable. Also the order is not interchangeable. This was a new way to tell the difference between a bicycle tire and a motorcycle tire, just by the “tire size”. Rim size is at bead seat. Rim measurement: You can measure any rim with a tape measure, and determine the tire size. Try to measure the rim diameter at the “porch”, where the tire sits, not the “lip” at the very edge. A 16″ rim will have a total diameter of 16.6″. So don’t count the lip. This method settles the confusion of whether a marking or specification is using the bicycle (tire OD) or motorcycle (tire ID) system. 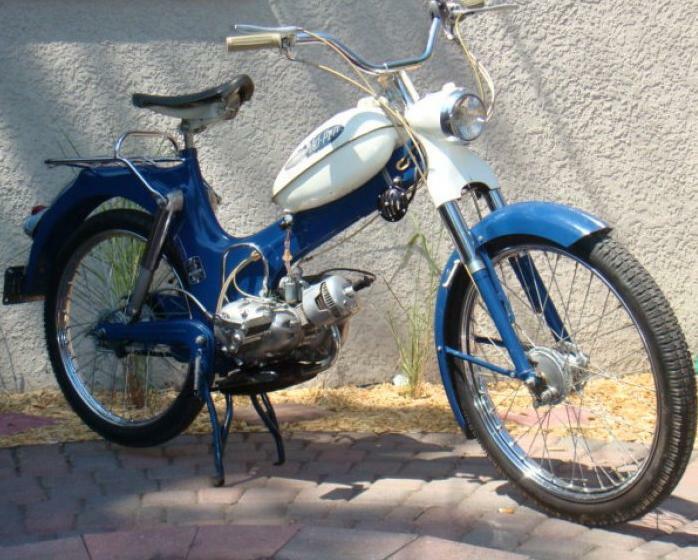 Older mopeds often have 2.25-18 (22 x 2.25) and 2.25-19 (23 x 2.25) tires. They used the bicycle system. 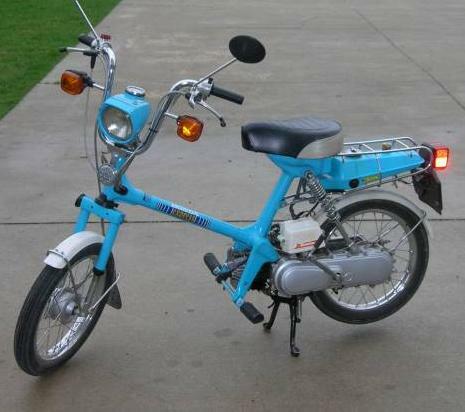 Modern moped-size (thin) tires, since the 1970’s, all use the motorcycle system, in the USA. Some modern electric scooters have an oddball size, 16 x 3.00. It’s a bicycle size, because a 16 x 2.25 bicycle tire fits, but wider. 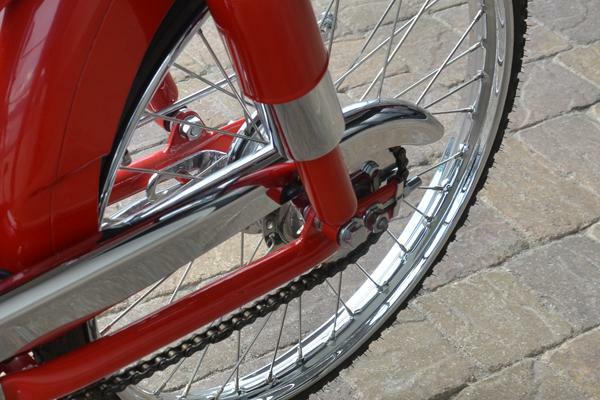 It’s a solid aluminum disk rear wheel, and so the inner tube valve stem must be the 90 degree type. The rim diameter at the “porch” is about 12″. 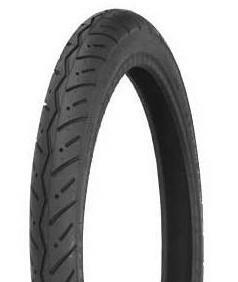 A motorcycle inner tube size 3.00-12 fits perfect, but they are only available with straight valve stems. Tires and tubes for those must be purchased from the dealer or distributor of those electric scooters. You are currently browsing the archives for the Tires and Tubes category.